Brief Synopsis – When a wealthy old woman hires a new caretaker for her house, her niece gets very suspicious of his true motives. My Take on it – This is actually quite an interesting idea that feels well ahead of it’s time. The story itself remains quite predictable the entire time yet they still manage to do a pretty good job of keeping things moving despite this. 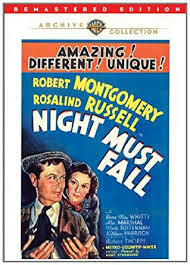 Robert Montgomery does a great job in the lead role and his performance managed to garner him a Best Actor Nomination for this role. The way that he plays his character with two different ways of interpreting all of his actions is great because it helps keep certain aspects of the story somewhat as a mystery. The dialogue is witty and is expertly written which helps keep things very engaging. The story itself stays interesting the entire time even though there is truly no mystery as to what direction things are moving towards the entire time. I wonder how a story like this would be presented today of this were to be remade and updated to today’s world. Bottom Line – Very interesting idea that feels a bit before its time. The story is quite predictable from the very start, but they still do a fine job moving the plot forward despite this fact. Montgomery does a wonderful job in the lead role which garnered him a Best Actor Nomination for the performance. The dialogue is expertly written and the story stays interesting the entire time despite the fact that it’s clear where things are leading the whole time. Recommended! It was re-made in the 1960s with Albert Finney. I’ve seen the Robert Montgomery version several times (I love it! ), but I’ve never seen the remake. Also of interest: Dwight Frye played the Robert Montgomery character onstage before he went into the movies. There’s a photo in his biography of Frye playing the character, dressed as a bellboy.